The Rotary Foundation is Rotary’s own and only charity delivering our vision of a better world. During the past 100 years, The Rotary Foundation has spent $3 billion on life-changing, sustainable projects around the world. With 91% of funds spent on the programmes and projects it delivers, The Rotary Foundation is globally recognised for its financial efficiency, accountability and transparency. Each year, The Rotary Foundation gives $70 million worth of grants to Rotary clubs throughout the world for humanitarian projects, vocational training and scholarships in Rotary’s cause areas. Ranging from small-scale, short term activities to large, international projects, Rotary grants strengthen global partnerships and provide sustainable and measurable benefits to communities. Grants from The Rotary Foundation support over 1,000 projects every year. The Rotary Foundation of the United Kingdom (RFUK) is an Associate Foundation of The Rotary Foundation. RFUK supports the aims of The Rotary Foundation by providing funding for its programmes and offering a direct service for giving in Great Britain and Ireland. RFUK has recovered over £1 million in Gift Aid since 2001, allowing even more communities to benefit from The Rotary Foundation. Since 1985, Rotary’s key humanitarian priority has been to rid the world of polio. For more than 30 years Rotary has led the campaign to rid the world of polio, protecting 2.5 billion children from paralysis and death. With Rotary advocacy and fundraising, we are on the brink of one of the greatest global health achievements ever. Rotary spearheaded the campaign at a time when there were over 1,000 polio cases a day in 125 countries, paralysing and even killing children. Today, the number of cases is down by 99.9%. 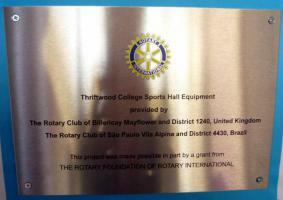 We're for Communities: Rotarians from across the District packed the hall at Thriftwood College for the official opening. It has been marvellous to see everyone pull together for the benefit of our local children. There is close to half a million dollars raised for End Polio Now through the World's Greatest Meal. There's still time for clubs in this District to help push through the $500,000 ceiling.